Be the first to share your favorite memory, photo or story of Clarice. This memorial page is dedicated for family, friends and future generations to celebrate the life of their loved one. 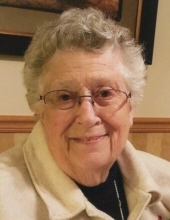 Clarice Jeanette Miskowicz (Barnard), age 87, of Plymouth, WI, passed away early Thursday (November 15, 2018) morning at the Waterford in Plymouth. Clarice was born August 7, 1931 in Iron Mountain, Michigan a daughter of Daniel and Winifred Schabel Barnard. Clarice, during her first seventeen years attended Lincoln School, Garden Village School and East Kingsford High. During these years she helped her mother around the house and helped with her siblings. When she turned seventeen, she headed out on her own and worked and lived in Chicago, IL; Milwaukee, WI; Green Bay, WI as a nanny and domestic house keeper. After a length of time she returned to her home town. In 1951, after a year and a half engagement, she married Harvey Stanley Miskowicz from Laona, WI. They were wed in Clarice’s parents’ home in Iron Mountain, MI. They found themselves moving around for awhile and lived in Denmark, WI for four years. Then her husband was transferred to Plymouth, WI where they made a permanent home for themselves and their four daughters. Clarice was a busy woman raising four girls and found that after twelve years that she had to go out and find work to help along with her spouse to pay never ending bills that went along with a growing family. She worked for Cleveland Container which turned over to Clev-pac and then Specialty Packaging Group. She had many different types of duties during her twenty-seven year stay in which she retired after those twenty-seven years. She also worked for CWSE making jewelry display units for a year and a half after her retirement. Clarice liked the outdoors; gardening; reading romance novels; going fishing with her husband; playing bingo with her group of friends and enjoying their company; crocheting, traveling to new places so she could experience all the different and interesting surroundings. Most of all she loved spending time with her family, grandchildren and friends. Even the grand pets sparked happiness in her heart whenever they were around. She enjoyed all types of music during her years here with us. Harvey preceded her in death on March 12, 2004. She is survived by her four daughters: Julie A. Miskowicz of Sheboygan, Karen R. (Steve) Renzelmann of Sheboygan, Janice F. (Steve) Guelig of Cascade, Brenda L. (Tom) Lawonn of Plymouth; Five grandchildren: Jason (Jill) Renzelmann, Roman L. Seville, Sheena (Carl) Krolnik, Markus (Emily) Renzelmann and Davis Renzelmann (Chloe); Three Great grandchildren: Onica, Matthew and Alexander; One sister: Rosalie (Margel) Van Gilder of Spencer, OH; Two sisters-in-law: Joan Barnard of Manitowoc and Dolly Pratz of Antigo. She is also survived by nieces, nephews, many other relatives and friends. Clarice was preceded in death by three brothers: Herbert (Mary) Barnard of Denmark, WI, Ellsworth Barnard of Two Rivers, WI and youngest brother Loren Barnard of Michigan; One sister Lola (Clarence) Barnard Briggs of Iron Mountain, MI and countless other family members. Memorial services will be held on Friday (Nov. 30, 2018) at 5:00 P.M. at Suchon Funeral Home in Plymouth. Chaplain Pat Hennen of Heartland Hospice will officiate. Clarice’s final resting place will be in the Plymouth Woodlawn Cemetery. Visitation will be held on Friday (Nov. 30) at Suchon Funeral Home from 3:00 P.M. until time of services. In lieu of flowers, a memorial fund is being established in Clarice’s name. The Suchon Funeral Home and Cremation Services of Plymouth is assisting her family. For online condolences, please visit www.suchonfh.com. The family would like to send a special thanks to the staff at the Waterford in Plymouth, Chaplain Pat Hennen, and Heartland Hospice (especially Jackie and Tara) for all the care and compassion given to Mom. To send flowers or a remembrance gift to the family of Clarice J. Miskowicz, please visit our Tribute Store. "Email Address" would like to share the life celebration of Clarice J. Miskowicz. Click on the "link" to go to share a favorite memory or leave a condolence message for the family.